The husband and wife team (who met working in an Italian restaurant in Tel Aviv) have serious credentials. They grew up in Israel and travelled to London. She worked as the Head of Pastry at Ottolenghi and then Executive Head Chef at Nopi and he as Head Chef at Ottolenghi. Their flavours are of Israel and the Middle East – think pistachios, honeyed hazelnuts, rose water, roasted fig, merguese sausage. There’s a casualness to the presentation but, in the small, whitewashed cafe, it works. And somehow even magnifies the brilliance of the food and the cooking. I’ve been for breakfast a couple of times. The first time was over a year ago, when it was easy to get a seat(!) They didn’t have anything on the menu that was gluten-free and dairy-free but, without hesitation, they cooked something up. 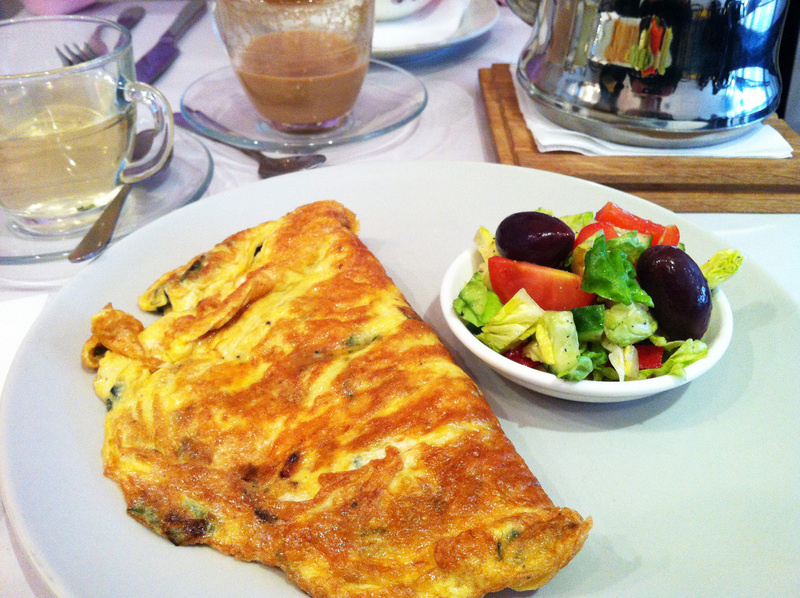 I was served a completely delicious, enticingly fragrant herb omelette. Then I went again recently and had the Sabich – aubergine, tahini and egg. Oh my it was good. Creamy from the tahini and soft melting flavours from the roasted aubergine. A simple recipe that comes together deliciously. Now I’ve had a taster with the Breakfasts, I need to go back for Lunch, Tea (to try the gluten-free cakes) and then Dinner (especially for the Flourless Chocolate Slice with Prunes in Whiskey & Salted Caramel)! 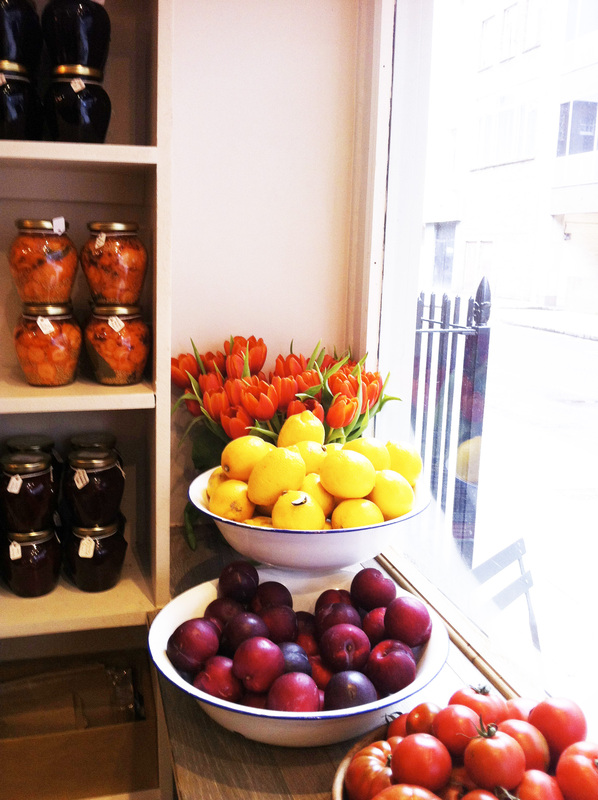 Honey & Co is at 25a Warren Street, London W1T 5LZ. Vegan food is everywhere is New York. 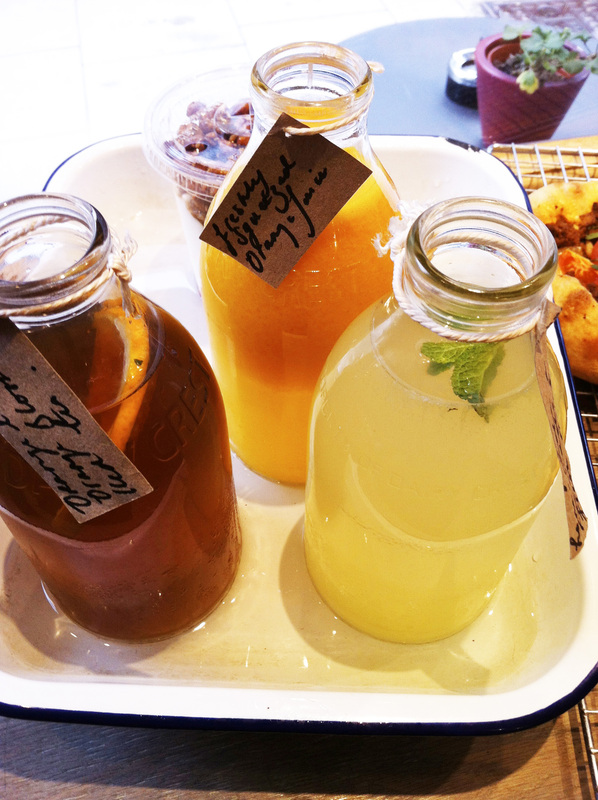 Clean and colourful, with delicious flavours and beautiful ingredients, it’s food that makes you feel good. 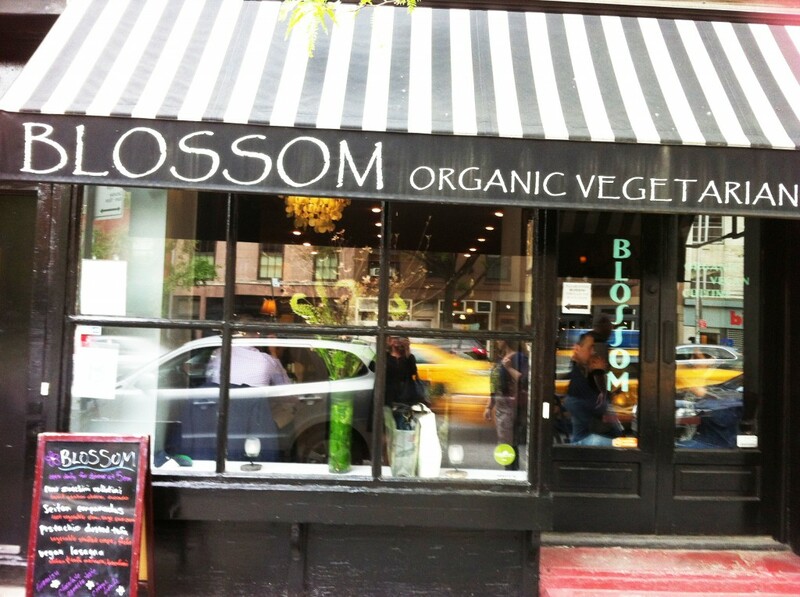 Blossom bills itself as Gourmet Organic Vegan Cuisine and won New York City’s Best Vegetarian Restaurant as voted by the readers of Time Out Magazine in both 2008 and 2009. Based in Chelsea, Upper West Side, Upper East Side and West Village, it was established to bring vegan dining to a fresh, new and delicious level. They focus on being “animal caring”, and their organic ingredients are sourced from local farms and small companies, creating food that doesn’t contain cholesterol or transfats. I went to the Chelsea Blossom which is a candlelit-velvet-curtains kind of place. There’s a great selection of dishes on the menu, and gluten-free, nut-free and seed-free are marked. And they even have a list of organic and gluten-free wines and beers. Yay! First up was the Raw Zucchini (Courgette) Rolatini and it was absolutely delicious. 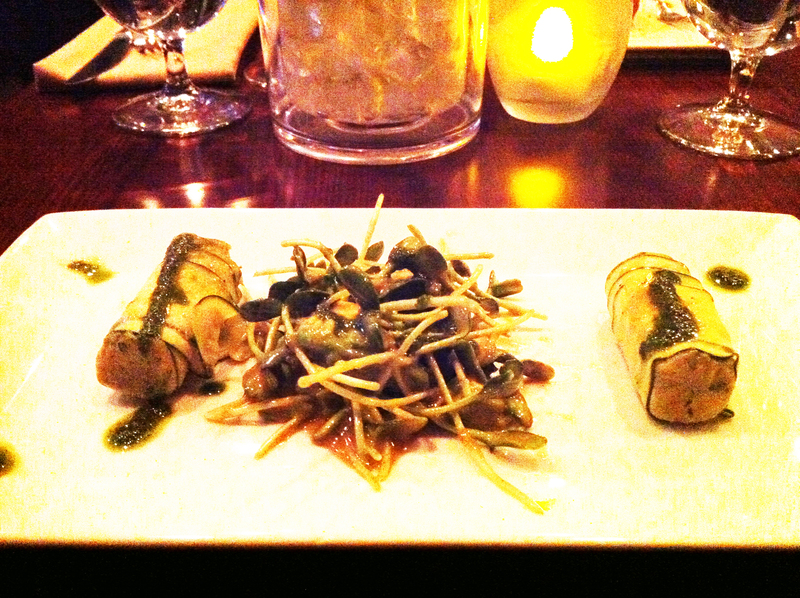 A basil cashew cheese filling, with chive oil, sesame & sunflower sprouts and avocado. This was a mixture of wonderful flavours (herby, seedy, sharp, very slightly sweet and very creamy) with full-on healthy food. To follow – the Vegetable Mezze Plate. I dithered between this and the Spaghetti Squash Cake with Wild Mushroom Risotto (and sautéed spinach, saffron cream sauce and pine nut garnish) but chose this because I can never normally eat a mezze plate, as they’re usually full of gluten and cheese. 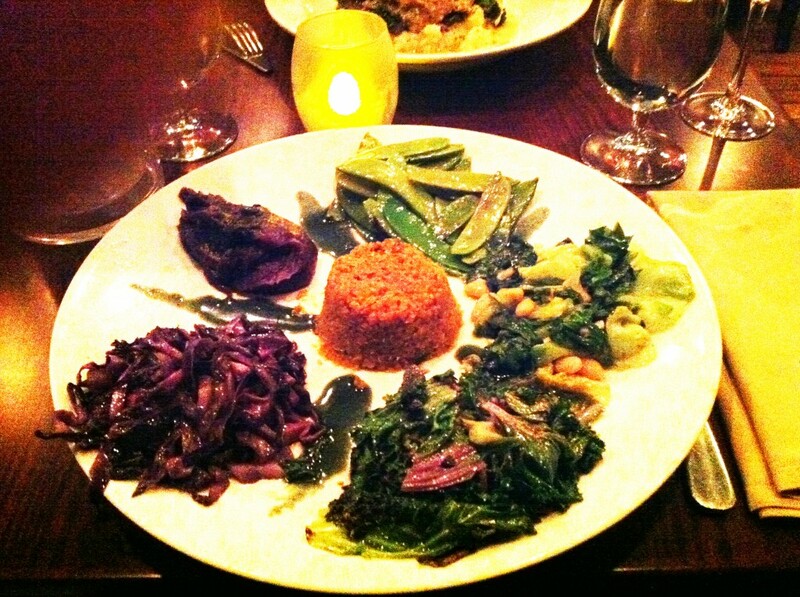 It starred sautéed red cabbage, escarole and cannellini beans, snow peas, sautéed kale, purple yam purée, spiced quinoa pilaff and tahini spirulina. The spiced quinoa and the purple yam purée were really good and the drizzles of tahini spirulina were a fantastic addition to the various vegetables and pulses. This is food where a lot of thought has gone into flavours and textures – which is what takes vegetarian or vegan food to the next level. 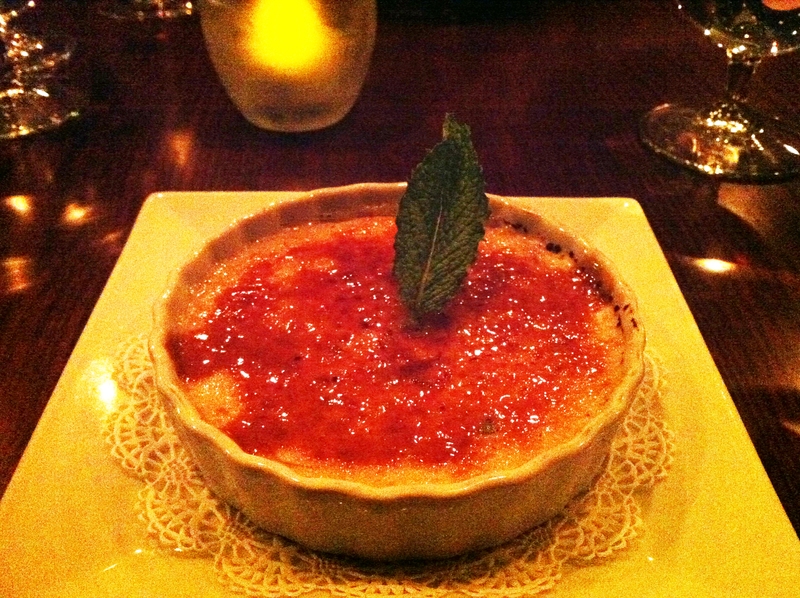 I finished with a Crème Brulée. Joy of joys. A dairy-free, creamy, caramelized pot of yumminess. You can go to the Blossom Bakery and Cookery School, sign up for private vegan baking lessons, get your event catered by them and even buy a vegan wedding cake! Blossom is at 187 Ninth Avenue, New York. Tucked away in the corner of Chelsea Market, NY, is Mŏkbar (literally a combination of English and Korean to mean ‘eat bar’). You can either order a take-away, to eat as you walk round the sights and sounds of Chelsea Market, or you can sit at the wooden bar, watching the chefs work in the open kitchen. 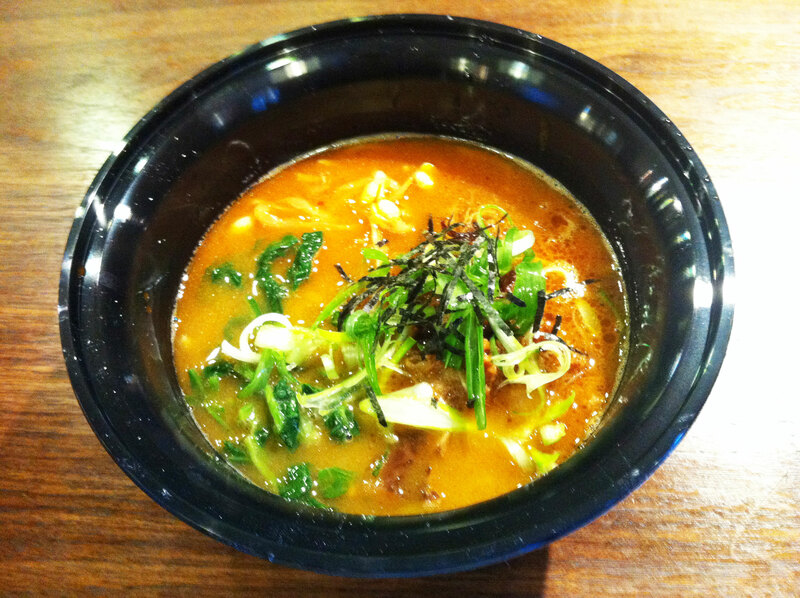 The food at Mŏkbar is a blend of traditional Korean (soups, kimchi, and ho cakes) with Japanese ramen noodles. It’s a great concept – and the food is inexpensive and delicious. For lunch, you can choose from a selection of Ramen dishes – the Mŏkbar Classic, Kimchi, Vegan Miso, Spicy Tofu, Black Bean, Cold – and you can add extras, such as spicy paste, pickled daikon or rice cake. All of these are dairy-free and you can order any of them gluten-free, too, as all the broths are gluten-free, and they will use rice instead of the ramen noodles. Both the Vegan Miso and the Cold can be vegan. I had the Mŏkbar Classic. A combination of meltingly-tender braised pork, chunky, spicy Asian mushrooms, fresh spinach leaves and spring onions created deep, satisfying flavours. I took one spoonful and then another, and another, and before I knew it the bowl was empty. It was really good. You’ll find Mŏkbar inside Chelsea Market at 75 9th ave, New York, NY 10011. 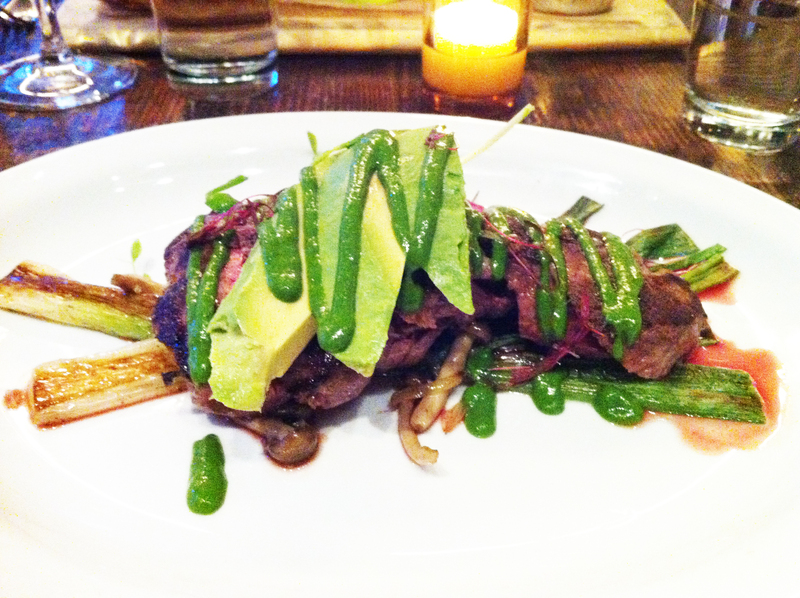 Bleecker Kitchen & Co is all about modern American cooking. The menu is seasonally-inspired, it’s unpretentious and welcoming, and there are both large and small plates all reasonably priced. The interior is perfectly aligned with the food – the industrial-style steel fixtures and exposed brick walls combine with wooden tabletops and warm lighting. And, based on the corner of Bleecker and Broadway, right in the centre of Greenwich Village – and with floor to ceiling windows – it’s a great place to watch the world of NoHo walk by. The food is comforting and full of great flavour combinations. And the ingredients are excellent. But be careful – they’re not great at gluten-free. The menu tells you that although every effort will be made to accommodate food allergies, they’re afraid that they cannot always guarantee meeting your needs. I was told I could have the Whole Grain Salad – Baby Greens, Chickpeas, Mushrooms, Cured Tomatoes, Fregola, Red Bell Peppers, Green Beans, Cipollini Onion, Olives and Lemon Vinaigrette. When I queried whether fregola was gluten-free, they assured me that it was. But it’s not. It’s a type of pasta from Sardinia. And it’s made from durum wheat. What they are brilliant at, though, is customer service. Once I clarified the fregola thing with them, they were more than happy to make a version of the salad without it. And when it came (with smiles and genuine friendliness), it was delicious. 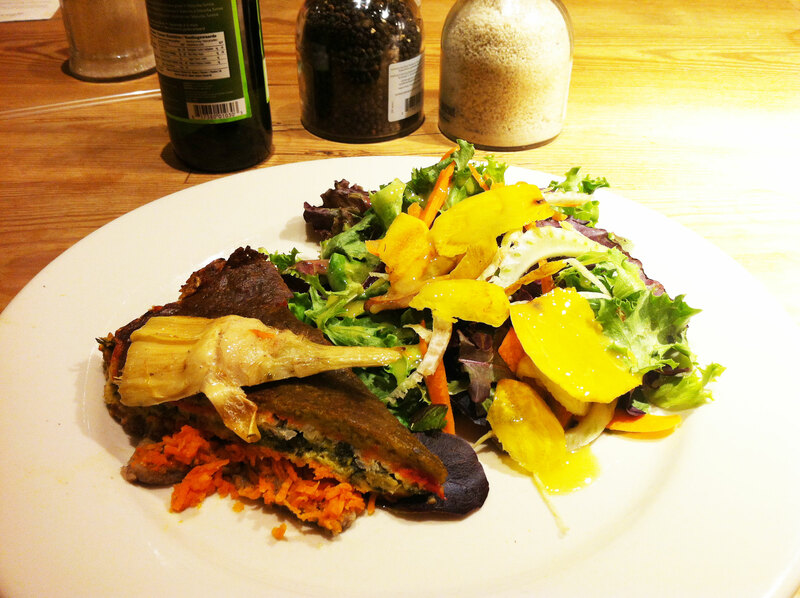 I went for a lovely lunch at Le Pain Quotidien when I was in New York. The bakery chain that focuses on serving classic, rustic loaves, started in 1990 in Brussels. It quickly grew to an international one, opening 200 locations throughout the world, including UK, US and Australia. There are bakeries, bakery classes, books and products (including foods, dinnerware and furniture). 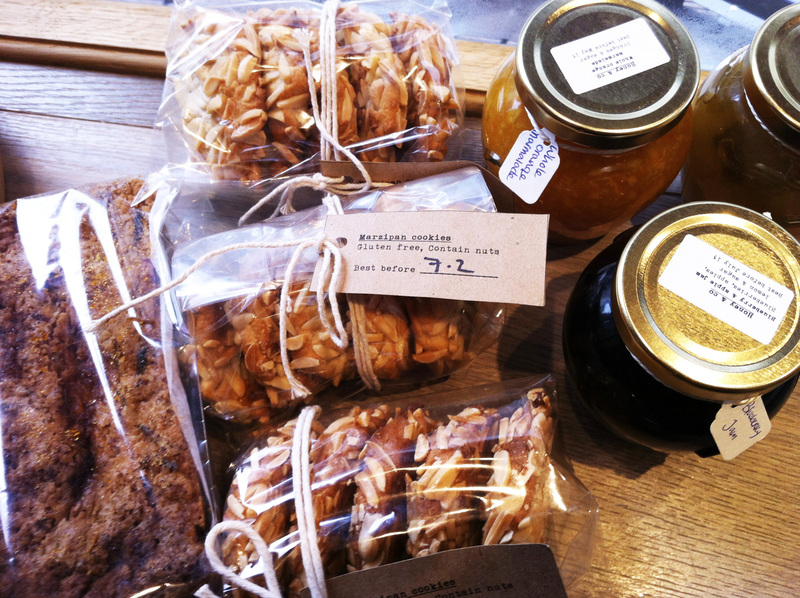 The bakery grew from Alain Coumont’s vision of sharing freshly-baked traditional bread. The sense of community is key for Le Pain Quotidien and they say it is “what nurtures, inspires and feeds the soul.” The first bakery was build with a communal table with wood salvaged from the floors of retired Belgian trains. 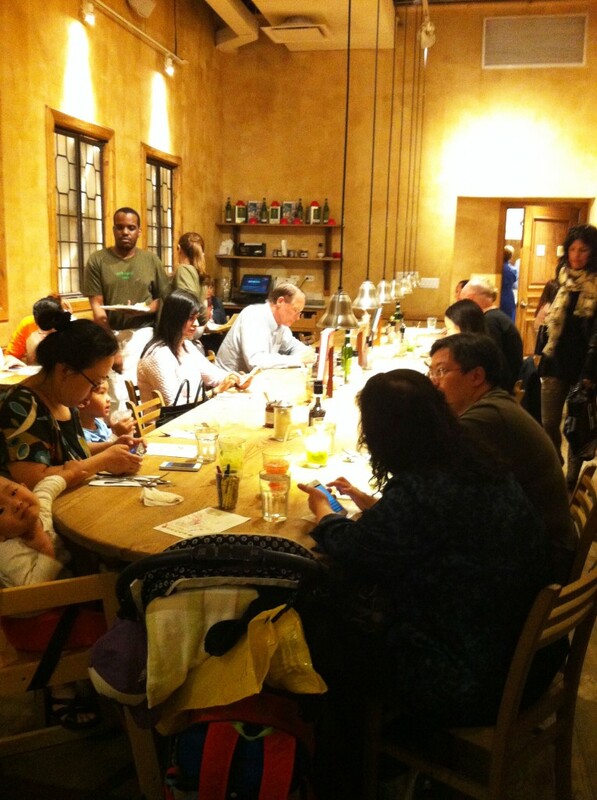 And the communal tables – made with reclaimed wood – have become their centerpiece. The menu is lovely, albeit very light on gluten-free options. There’s a range of Hot Dishes, Tartines (Belgian open-faced sandwiches), Salads and Sharing & Small Plates. They say that they keep it simple by starting with fresh, wholesome ingredients and sourcing organic and locally where possible. Vegan dishes are highlighted, as are the dishes that have a gluten-free option or can be made with gluten-free ingredients. All of the tartines could be made with gluten-free bread and there was also a gluten-free/vegan Six-Vegetable Tart, with artichoke, vegetables and tofu on a gluten-free buckwheat crust, so I ordered that. It was delicious. The crust was full of buckwheat-nutty flavours and the artichokes and all the different vegetables created different layers of flavours and textures. 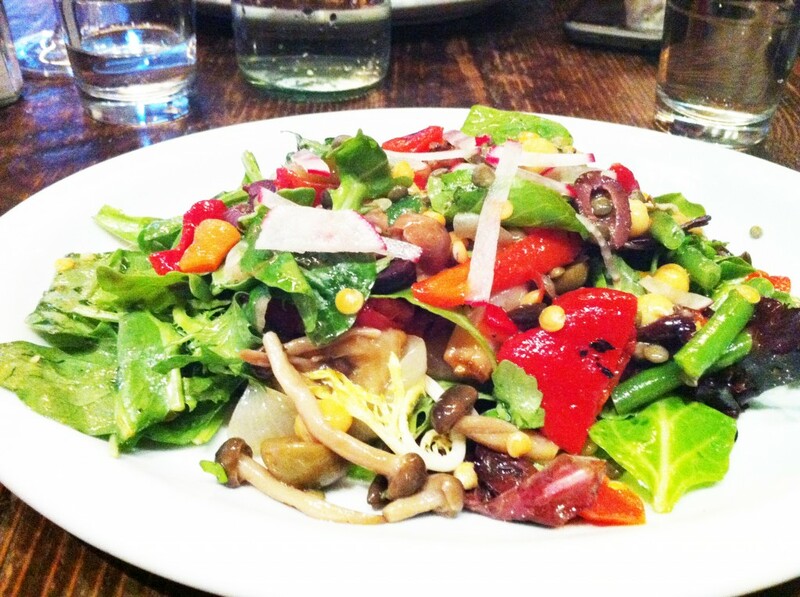 It came with a salad – and there was some seriously good olive oil for drizzling over. Really delicious. But also a very small portion!